These two photographs show Dr. Will with his secretarial staff and at his 60th birthday party. Dr. Will is known as one of the key influences in the development of a psychiatric guide which later became known as the Diagnostic and Statistical Manual of Mental Disorders, still in use today in revised form. William C. Menninger, M.D. 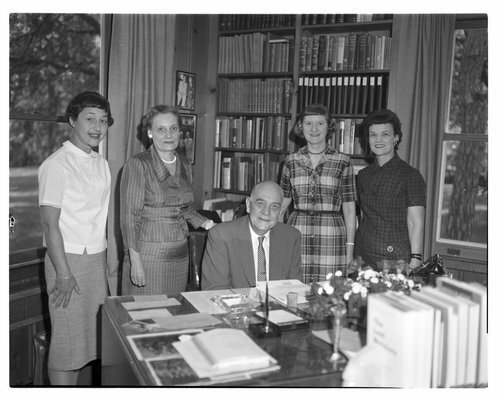 - Dr. Will is shown with his secretarial staff in his office in July 1959. They are, left to right, Mrs. Laura Fisher, Miss Lena Forbes, Dr. Will, Miss Georgia Burns, Mrs. Velma Bartley.